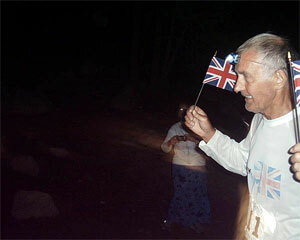 “Death Valley” Jack Denness is something of a legend at the Badwater Ultramarathon. A ten-time finisher before the 2004 race, including a double crossing in the early 1990’s, he entered with high hopes of keeping up with Marshall Ulrich and maintaining his place as joint record finisher at the event. Crewing for Jack was a no-brainer for me. Certified loonies from the UK may be plentiful, but few of them live just a few miles from the town I called home before I moved to Boulder, Colorado. 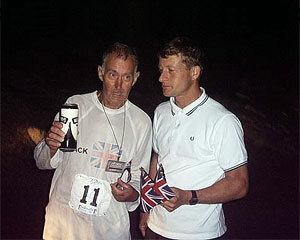 Jack seemed the kind of character I could work with: his jovial appearance in the documentary ‘Running On The Sun’ kept my spirits up, even as my dream of completing the race myself in 2006 seemed to dissipate with every piece of graphic footage of a foot worn down to a virulent blister. And let’s face it; we both enjoy a Murphy’s Irish Stout from time to time. Meeting Jack for the first time in Las Vegas a couple of days before the race, my suspicions were confirmed. He was nuts. He hadn’t trained properly this year—perhaps finishing ten times had made him somewhat blasé about the whole affair, or perhaps the fact that he was just one year from his seventieth birthday was slowing him down at last. Either way, for the first time he wasn’t completely prepared. But before I continue, let me reassure you that this story has a happy ending. Jack did finish, albeit in a time outside the cut-off. And the Badwater organizers were kind enough to keep the Mt. Whitney finish open for him in recognition of his longtime commitment to the race. He was awarded an Honorable Finisher medal, and great credit should go to the Kostman brothers for their generosity in recognizing this year’s achievement. Darla, Jen, Keith and I were awake at 4:30am the morning of the race. We spent the moments before the race taking the obligatory photos and video footage of the runners, and then cheered as they set off on their odyssey. Jack trotted along merrily for the first mile, and then began walking. He didn’t run another step for the next 134 miles! Thanks to a new rule created at least in part for Jack’s benefit, he could now be paced before Furnace Creek. I walked a few miles with him before he obviously revisited his expectations of the race. It was to be a race of attrition, a battle not against time but against the gradual wearing down of his body over nearly three days. I think Jack acknowledged this early, though his crew—and loyal wife, Mags only realized later. 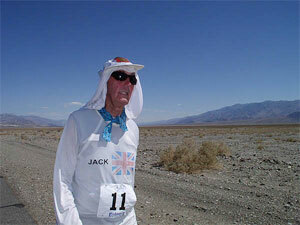 Between Furnace Creek and Panamint Springs, Jack wouldn’t be paced. He had set his heart on finishing almost entirely by himself, although later he would be glad of company. 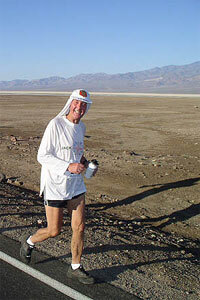 His stride deliberate and determined, he weathered the early morning heat well and reached Furnace Creek in fine fettle. Our crew had divided into two teams: me and my partner Jen, and Darla (a race crew veteran and team leader) and Keith together. During the entire time we spent on the road we worked as a remarkably efficient and friendly team. Our combined focus on getting our athlete to the finish tied us together even when we were working apart. Our roles became second nature—Jen driving the van and preparing fresh bandanas and headgear for Jack, me enjoying the opportunity to spray someone with a squirt gun and get away with it. The heat was intense, but we didn’t suffer. We kept well-hydrated, well-covered and took regular air-conditioned breaks in the van. Having read plenty of horror stories about the crew melting while the runner continued on apace, we knew that we owed it to Jack to be prepared. For me, the weather was positively balmy—I’d spent all summer in Colorado running long distances in seven or eight layers of clothes, and my sauna workouts were up to 45 minutes each. I was ready for Death Valley—at least, for the small portions of it that I would walk with Jack. Our crew shifts generally lasted around eight hours each. We snatched sleep at almost every rest point, so our fatigue, though very real, was not nearly as bad as we expected. As Jen later commented, the race should never be an ordeal for the crew. Without two teams, we would have been in real trouble. Through Stovepipe and up a seventeen-mile hill, Jack continued steadily. His gait was strong, his steps sure and his demeanor good. Jen and I took turns blasting the James Bond theme to Jack to keep him in the mood for action, and as he walked into the night he was certainly slower than expected, but by no means down and out. Approaching Panamint Springs, however, things took a turn for the worse. Jack was exhausted, too tired even to catch a few moments of sleep in the runners’ room (and not helped by the noise of a couple of less-than-considerate competitors’ crews). He lay on the bed for a while, refusing even to take off the shoes that would adorn his feet for the entire race. Finally, as evening drew in for the second time, he struggled to his feet and continued. As we set off again up the hill, we realized that we were hours behind schedule. There was no chance of Jack finishing within 60 hours. In fact, we projected around 72–74 hours at that point. Still unaware that Jack intended to finish the course whatever, we began to seriously consider asking him to pull out of the race. Mags would not hear of it, of course, her experience of Jack being so much greater than ours. Even so, it weighed heavily on our minds. Another worry was the state of Jack’s feet. We spent some time treating blisters on the hill, and I decided to walk behind him a hundred feet to ensure that cars saw my flashing red rear light before reaching Jack on this narrow, winding stretch. Jack didn’t realize this, and at one point when the van was long out of sight he stopped for a rest against a guardrail. Padding up silently behind him, I asked if he was ok. He sprang a couple of feet into the air, utterly shocked to hear another human voice! 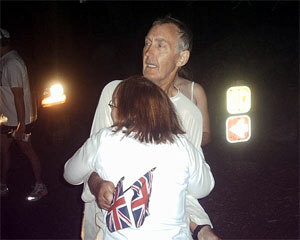 I walked all night with Jack, occasionally running ahead to warn oncoming cars of our presence. It was a dreamy, wafting experience to walk with my head turned up to the dark, moonless sky. Jen and I saw the occasional shooting star, and she even walked a couple of miles behind Jack herself. It was by far our favorite part of the experience. As dawn broke, the extent of Jack’s troubles became clear. He was leaning heavily to the left, a position we came to call The Leaning Tower of Jack. His steps had slowed to a shuffle, and he was hardly coherent at the regular half-mile stop-offs as we began descending again. Then something remarkable happened. The dark blue early morning sky began to lighten, and Jen, a quarter mile ahead of us in the van, began playing an Alice Krauss track from the soundtrack to ‘O Brother, Where Art Thou?’ It is, for those who have not yet heard it, an inspiring and uplifting gospel-style tune, complete with full choir as it builds from a single voice to a vast, expansive climax. As the song progressed, Jack’s steps became surer. His lean became less pronounced. His head lifted, and an overwhelming understanding of his nobility overcame me. This was a remarkable man—a man who had raised thousands for good causes, who had traveled the earth to find challenges worthy of him, who was refusing to give up despite the knowledge that he could not complete the race in the stipulated time. From my vantage point a hundred feet behind him, I could see that whatever else happened on this journey, Jack would finish it with or without us. 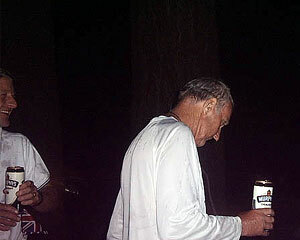 Our team-mates appeared shortly afterwards and we only rejoined Jack some way out of Lone Pine. He had made up a couple of hours since we left him, striding along gallantly as he passed the familiar landmarks that told him he was finally nearing the base of Mt. Whitney. By now, he was happy to have company and I walked with him in the heat, spraying him down frequently (it was the only time that the heat really got to him). Dozens of crew and finishers came out to see Jack and wish him well, offering drinks and unloading crates of yogurt for us. When we finally reached Lone Pine and handed off to the other crew again, we knew that we’d be seeing him at the finish in a few hours. It must have been slow going, but with the support of his team, not to mention Wayne Simpson and his crew too, Jack was nearing the top when we got there at 1:30 a.m. or so. The finish itself was emotional for all of us. We were so proud of our athlete that we could hardly contain ourselves, desperate to be one of the many people trying to hug him. He drenched himself in Murphy’s and was presented with his finisher’s medal, and graciously thanked his crew for spending so much time out on the road with him. To say we got more than we bargained for would be an understatement. The experience for me, a future runner, and for Jen, a future crew leader, was invaluable. The sense of camaraderie amongst the runners was wonderful, and the feeling of finishing, albeit a vicariously, was one of the highlights of my year. My commitment to running Badwater has only become stronger thanks to the experience of crewing. I recommend it to anyone who wants to run the race—indeed, I would advocate making one race as a crew member a mandatory requirement for entry. If you’re considering crewing, three bits of advice for you. First, take the night shift if possible, or at least part of it. It’s a magical experience to run alone in the night in Death Valley. Second, believe in your runner. Have no doubt that anyone who is accepted to this race has the capacity and the will to finish. Some don’t finish of course, but it’s not through lack of capability or training. It just doesn’t work out for them on the day. And third, bring the soundtrack to ‘O Brother, Where Art Thou’ and watch your runner stand tall and proud as it plays at dawn—it’s a memory you’ll treasure forever. Photos by Chris Kostman and Keith Kostman.